Giambattista Tiepolo, Perseus and Andromeda, ca. 1730–31. Oil on canvas. The Frick Collection will exhibit a selection of paintings, drawings, prints, and photographs related to Giambattista Tiepolo’s first significant project outside of Venice, a series of ceiling frescoes for Palazzo Archinto in Milan. The frescoes were painted between 1730 and 1731 and commissioned by Count Carlo Archinto, one of the most prominent patrons and intellectuals in Milan during the late seventeenth and early eighteenth centuries. Tragically, Palazzo Archinto was bombed during World War II and its interior was completely destroyed. Tiepolo in Milan will present about fifty objects from collections in the United States and Europe to tell the story of this important commission. 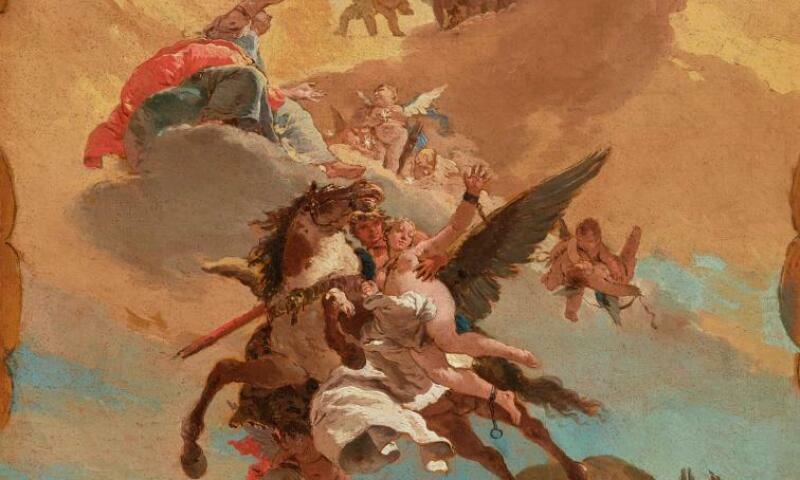 Six preparatory works by Tiepolo will be featured: three paintings (among them, the Frick’s oil sketch Perseus and Andromeda) and three drawings. Complementary drawings and several books of illustrations by the artist will be on view, alongside black-and-white photographs taken between 1897 and the late 1930s, the only surviving records of the finished frescoes in situ.